A St. Patrick’s dinner of corned beef, cabbage, and potatoes. Photo by Donna Turner Ruhlman. Never pass up an excuse to corn beef. Start now for St. Patrick’s day dinner. Or for whenever. The cure takes five days, so plan ahead. I recently got a question about curing it at room temperature. The brine is a nearly 10 percent salt solution, so I imagine it would be fine for five days. Also remember that after it’s cured you can keep it refrigerated for about a week before cooking. And you could keep it indefinitely in the fridge in the brine, but you’d have to be sure to cook the salt out of it after. Any cut of beef can be “corned.” (See my pastrami short ribs.) But the best cuts are the tougher, less-expensive cuts such as brisket. The only uncommon ingredient is the sodium nitrite, pink salt, available here and also from Amazon. This is what accounts for the deep red color of the beef and also gives it its distinctive flavor. I think it’s important, but it’s not necessary from a safety standpoint. The following recipe is from Charcuterie: The Craft of Salting, Smoking, and Curing. 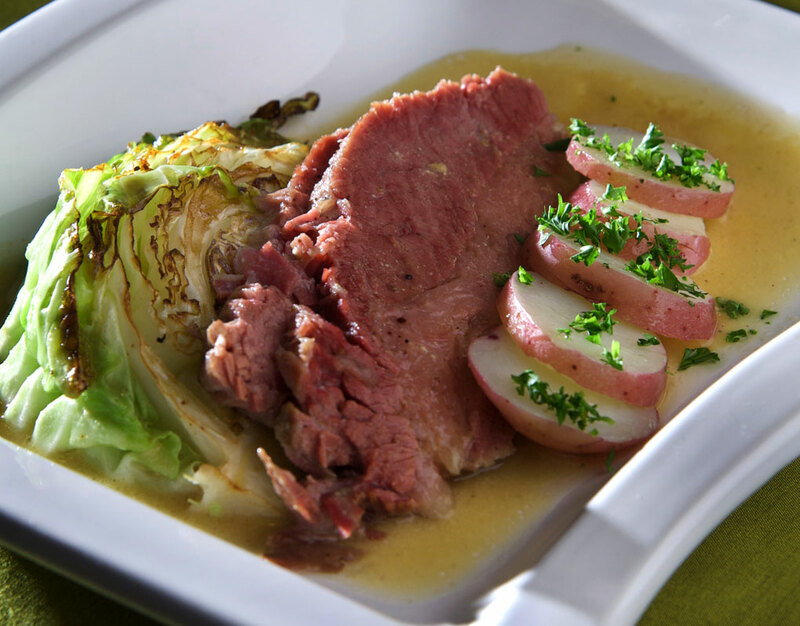 The recipe for corned beef and cabbage, the dish featured above, is here. There’s also a recipe for braised cabbage in my book How to Braise. In a pot large enough to hold the brisket, combine 1 gallon of water with the kosher salt, sugar, sodium nitrite (if using), garlic, and 2 tablespoons of the pickling spice. Bring to a simmer, stirring until the salt and sugar are dissolved. Remove from the heat and let cool to room temperature, then refrigerate until chilled. Place the brisket in the brine, weighted with a plate to keep it submerged; cover. Refrigerate for 5 days. Remove the brisket from the brine and rinse thoroughly. Place in a pot just large enough to hold it. Cover with water and add the carrot, onion, celery, and remaining 2 tablespoons pickling spice. Bring to a boil over high heat, reduce the heat to low, and cover. Simmer gently until the brisket is fork-tender, about 3 hours, adding water if needed to cover the brisket. Keep warm until ready to serve. The meat can be refrigerated for several days in the cooking liquid. Reheat in the liquid or serve chilled. Slice thinly and serve on a sandwich or with additional vegetables simmered until tender in the cooking liquid. *A note about the salt: The salt level is not hugely critical here because it’s basically boiled, and the excess salt moves into the cooking liquid. You can weigh out 12 ounces here if you feel better using a scale (approximately a 10% brine). Or you can simply make a 5% brine of however much water you need to cover (6.4 ounces per gallon). When you cook it, season the cooking liquid to the level you want your meat seasoned. Another option is wrapping the brisket in foil and cooking it in a 225°F oven till tender, but do this only if you’ve used the 5% brine. Combine the peppercorns, mustard seeds, and coriander seeds in a small dry pan. Place over medium heat and stir until fragrant, being careful not to burn them; keep the lid handy in case the seeds pop. Crack the peppercorns and seeds in a mortar and pestle or with the side of a knife on a cutting board. Combine with other spices and mix well. Store in a tightly sealed container. My past posts on Hawaii, Steak Florentine, and Greyhound. Learn more about whiskey from the Irish Whiskey Society of America. Try using a pressure cooker to prepare your corned beef dinner. Have extra corned beef? Make this corned beef soup with your leftovers. Leaving it at room temp to cure — that would make life easier in terms of fridge space. In general, how important is temperature in the initial curing stage, whether in a salty brine or in a salt pack (as for, say, prosciutto)? Can I leave something in salt/brine in my 50-55 degree basement? For how long? All the books just say to refrigerate, but I don’t have an extra fridge these days, so I end up using a cooler and adding ice packs as needed, or keeping things outside if the temp happens to be right. Matt, if you can’t keep the brine cold don’t even try and make this. For food safety you must keep everything at refrigerator temperatures and the brine must be cold before you put the meat in it. Keep everything below about 4 C or 38 F.
I use the vegetable drawer on the bottom of refrigerator, holds two briskets, one for corned beef, and one for pastrami. Why not do both, it’s the same brine? And I recently discovered burnt ends, have a recipe using a brined whole brisket. The preferred corned beef in New England is gray, cured without pink salt. Just an observation. I buy brisket once a year (to make this), because it is the single most expensive cut of meat at my butcher. This year its was $9.50/lb at my local budget grocer. If I go to the local farmers it is the same issue, because it is the most sought after cut. I have tried other cuts, but anything else normally referred to “inexpensive” like flank steak is right up there too. Lets call it the “kamado grill effect” but I think its time to stop referring to these cuts as inexpensive, and maybe rather the “most heavily worked” muscles. I have tried chuck and bottom round, but they are not the same for me. Michael – do you prefer to use first or second cut of brisket for corned beef? Would I need to double the brine recipe if I use a 11lb brisket? I bought an 8 lb brisket flat today and have a question. Is it okay to use this same recipe for the larger piece or would it require more salt and sugar? Juuust on the off chance anyone would try to cook with straight sodium nitrite — “pink salt (sodium nitrite)” is not to mean that ‘pink salt’ is sodium nitrite. Pink salt is table salt with a small percentage of nitrite mixed in, plus the coloring. Looks great can’t wait to make this. Is there a healthier alternative to sodium nitrite though? Thanks for sharing. I want to make the corned beef above as well as smoke half of the brisket for pastrami. But, the brining times and amount of pickling spices used are different for each method. Instead of brining, resting, and then smoking, should cook the brisket as recommended for corned beef, and then halve the meat to smoke a portion for the pastrami? Thank you for the advise! Looks delicious, just have to try it! Thanks for sharing Michael, you’re awesome! When I tried this recipe the meat was a much darker red inside than the meat in your picture. Any idea why would this be? It’s not nice tto think about the worst case eventualities relating to planning a business’ future.